The motivation behind my most recent travels came from the tv documentary ‘Planet Earth’. I have always loved the series and dreamt about the opportunity to visit and explore each destination. One particular episode really caught my eye and instantly I knew that I HAD to do it, and that was an episode based in Harar in Ethiopia about a native man hand feeding wild Hyenas. After a lot of research and planning, my bags were packed and I was heading to Ethiopia. Ethiopia is not only the oldest independent country in Africa but also the oldest in the world. I had set myself two main goals during my time in Ethiopia, firstly to backpack across the country and secondly to visit the hyenas in Harar. Harar is the capital of the Harari region of Ethiopia. The city of Harar is located on a hilltop in the eastern extension of the Ethiopian Highlands, about five hundred kilometres from Addis Ababa at an elevation of 1,885 meters. Once I got to Harar, it didn’t take me long to learn all about Yusuf (whom I watched featured on Planet Earth). Yusuf has a close relationship with the hyenas, so you can imagine how excited and secure I felt. 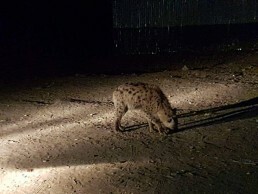 After sunset the Hyena men would head out towards the edge of the city to the feeding spot, there are two spots for feeding, one being in the middle of nowhere and the other being at Flana Gate Slaughter House. I arrived at the Slaughterhouse around 8 pm and watched the Hyena man call to the wild Hyenas in the ‘hyena dialect’ a mixture between English and Oromo, a unique and fascinating experience. The Hyena man has even given names to each of the hyenas which they seem to respond to. 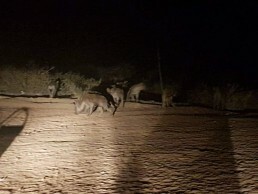 It took a few hours for the hyena man to call out the Hyenas, but it was an incredible experience to watch, he walked around the block calling on the wild hyenas to come to him. He would call to the hyenas with a basket of fresh meat from the butchers and they would answer him back, almost like pets. After a long 2 and a half hours of walking the hyenas around the block, they were ready for more human interaction, this time, from me. I stood there watching in such amazement that I didn’t even realise he was calling me forward to hand-feed these animals. When I got closer, he asked me to kneel next to him, he held some meat above my head while the hyenas fed from his hand, just inches away from my face. I could feel the warm breath of the hyena, breathing down my neck and I can hardly express in words what I felt. But it was at this point that I felt the neck of a hyena rub against mine and for the first time I really appreciated the sheer power of these animals. He handed me a fresh piece of meat, to feed the wild hyena from my hand. No stick like you may have seen others! Just my hand and this small piece of raw meat. Ahh, at last, the real reason I had come here, I was finally going to have the opportunity to do something I had longed to do. Of course, I was nervous, but I had to do it because I quickly reminded myself that unique opportunities only come around once in a lifetime. My first attempt didn’t go so well, mainly because I was so nervous, so nervous that I dropped the meat. Wouldn’t you after feeling a huge sense of power from these animals? Nevertheless, I had to find the confidence and be the courageous man I have always been. I attempted for the second time and my second attempt was successful. I wasn’t as afraid this time, as I knew I had to hide my fear, especially when faced with these large and deadly animals. There were around seven hyenas nearby, but only three opted to come close enough to be fed. I would have loved to feed all of them, but the remaining four refused to comply and given that they are wild animals and could, cause serious injury or even death upon being provoked, the hyena man was wise enough not to prompt them to become violent by forcing them to come to him. According to written records, hyenas have existed in Harar for over 500 years. Through extensive readings about hyenas in Harar, I discovered that the regular feeding of hyenas in this city did not start until the 1960s. This practice was initiated by a farmer who decided to feed the hyenas with fresh meat so that they didn’t invade his farms and attack his livestock. Harar is presently a tourist hub for people who are interested in meeting and hand-feeding wild hyenas. Sometimes, the hyena men go as far as feeding the hyenas from their mouth just to wow the spectators. Tourists watch the show at a negotiable rate through a guide. However, recently the practice has been on a decline as a result of the reduced numbers of hyenas compared to many years ago. Before heading off to Harar please remember these are wild animals and you do so at your own risk. Hyenas are the second largest land predators in Africa and have the most powerful jaws. Wow! that looks a bit to hairy! You looked a bit nervous……where you? Yes, it was a little hairy. I was a little nervous, after hearing him call them for a while, you really learn that they are truly wild and after seeing them kill on a previous African trip it was a tad nerve-racking. Wow Kevin that had to be an awesome experience! Was it scary? I went to Tiger temple in BKK and it wasn’t so scary as the tigers were really on drugs, which was sad…will never go again. Yes, it was an incredible experience, and definitely a little scary. I too have done tigers in Thailand and yes you have to be careful as a lot of them are drugged and only for the purpose of tourist, such a shame. That’s what made this so incredible as they were totally wild!. Cool seeing that again.the music went well with what you was doing.looks good. Wow! This is such a unique experience. Can’t believe they have been living there for 500 years! That is a long time to be in the same habitat. You are brave! It has been a unique experience, the most unique I’ve ever had. Yes, 500 years living together, it’s a very long time. I think I was brave too 🙂 thank you. Some of those are much larger than I thought. I always pictured them as slightly smaller, but with jaws that make up for that lack of size. Cool trip. I too always pictured them to be smaller, but when next to them I was surprised on the size of them, especially the neck size. When it nudged me is when I really understood the power of Hyenas. Those are some large creatures? Sure you wasn’t scared ? Yes, they were very large, much larger than I expected. I was a little scared, it was a nerve-racking experience. Posts like this brgteihn up my day. Thanks for taking the time. I remember watching this on Planet Earth 2 & thought they looked crazy! I can’t believe you were brave enough to try it! Must’ve been an awesome experience. When I watched it on Planet Earth 2 I thought the same, I’m so glad I did it. It really was an awesome experience. Wow! I would have been way nervous too, but this definitely sounds like something I would do. I was a little concerned at first, since feeding wild animals is normally a no-no. But I understand the reasoning behind feeding them so they don’t go after livestock. I wonder if the locals have noticed any impact on the town, as far as increased presence of the hyenas. Like, are the hyenas becoming more confident in roaming the town because they know they can get fed there? I was a little bit nervous but I guess that’s only expected. Yes, feeding wild animals is a big no-no but after seeing and learning why they do it I had to get involved. The locals said they have seen the difference in their livestock. I thought the same about the becoming confident enough to roam the town but it seems they only come out at night just for the food on offer. Wow now that is something that you don’t get to experience everyday! You were certainly brave being that close to them. Yes, not something you get to experience everyday, I agree I had to be brave, it was very nerve-racking. I love that you saw this on tv and hopped on a plane and made it happen– that’s awesome. I don’t know if I would do it though– I’m probably too scared! It’s an incredible story though. Thank you, the second I saw it I had to do it or at least go and see for myself. Most of more travels come from things I see on t.v and just have to do it. What an amazing experience! One day I also want to go to Ethiopia! Thank you, Ethiopia is a great place to visit, I too hope you one-day visit. I don’t know how I’d feel about doing that! It would be really cool to see them feeding through for sure. I was nervous but it was really cool to watch him play around with them almost like a pet. This is a wild adventure. You are so brave! Getting anywhere near a hyena is outrageous. Feeding one by hand is almost insane. Of course, I’d love to do it too. Wow that is some one wild but interesting experience. 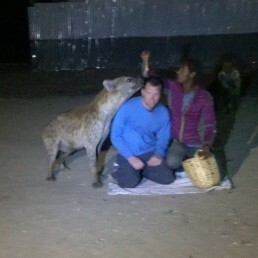 I never knew you can get that close and even feed a Hyena. They seem very friendly though. Thank you, it was a great adventure, I never knew neither until I saw it on t.v. Yes, they seemed freindly. Watching him feed and play with them reminded me of a pet dog. I love watching the too, And I just love the way they laugh. They are great to watch and definitely scary. It really was a great experience that makes for a cool story. Ethiopia continues to be one of the most fascinating African countries to me. Few people know more about it than the starving children they saw on TV in the 1980s and 1990s. But it’s not only a diverse country with diverse landscapes between dry desert and lush greenery it’s also the only African nation never to be colonialized. It’s so eye-opening to travel the different regions and explore very unique customs. I never made it to Harar. So thank you for your account of the hyena feeding. Such an incredible experience, thanks so much for sharing! I’ve always had a sort of fearful respect for the power of hyenas … and now it looks like i have something new to add to my travel musts! Wow! Incredible experience. To have a hyena that close to you and eating out of your hand or breathing on your neck is nothing short of incredible. The video is amazing and really gives great perspective. This is a great story. Whoa! Feeding hyenas? That is one unique experience. We normally do not hand-feed wild animals (we’re mountaineers and scuba divers). But we would be open to take that chance. And oh yes, the power and majesty of these wild animals are just overwhelming. Wow this sounds like an AMAZING experience, Kevin! Damn I would give an arm to do this (pun intended lol). Looks like Ethopia was good for you! Thank you, it really was an incredible experience that I wont forget. Ethiopia was a great place to explore.